Cabalistic term for "emanation" or "eradiation"; but philosophical authors prefer "shefa'" or "hashpa'ah." The word is derived from "aẓal" in reference to Num. xi. 17; and in this sense it was taken over into the Cabala from Solomon ibn Gabirol's "Meḳor Ḥayyim" (The Fountain of Life), which was much used by cabalists. The theory of emanation, which is conceived as a free act of the will of God, endeavors to surmount the difficulties that attach to the idea of creation in its relation to God. These difficulties are threefold: (1) the act of creation involves a change in the unchangeable being of God; (2) it is incomprehensible how the absolutely infinite and perfect being could have produced such imperfect and finite beings; (3) a creatio ex nihilo is difficult to imagine. The simile used for the emanation is either the soaked sponge that emits spontaneously the water it has absorbed, or the gushing spring that overflows, or the sunlight that sends forth its rays—parts of its own essence—everywhere, without losing any portion, however infinitesimal, of its being. Since it was the lastnamed simile that chiefly occupied and influenced the cabalistic writers, Aẓilut must properly be taken to mean "eradiation" (compare Zohar, Exodus Yitro, 86b). Later on the expression "Aẓilut" assumed a more specific meaning, influenced no doubt by the little work, "Maseket Aẓilut." Herein for the first time (following Isa. xliii. 7: "I have created"; "I have formed"; "I have made"; ), the four worlds are distinguished: Aẓilah, Beriah, Yeẓirah, and 'Asiyah. 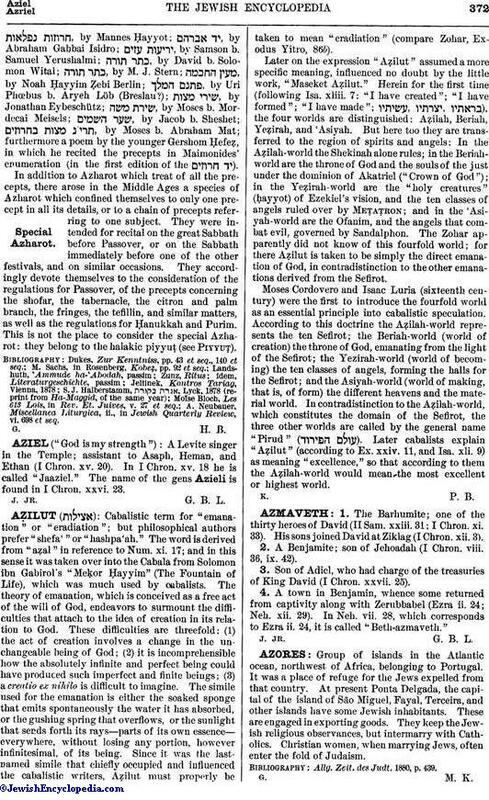 But here too they are transferred to the region of spirits and angels: In the Aẓilah-world the Shekinah alone rules; in the Beriah-world are the throne of God and the souls of the just under the dominion of Akatriel ("Crown of God"); in the Yeẓirah-world are the "holy creatures" (ḥayyot) of Ezekiel's vision, and the ten classes of angels ruled over by Meṭaṭron; and in the 'Asiyah-world are the Ofanim, and the angels that combat evil, governed by Sandalphon. The Zohar apparently did not know of this fourfold world; for there Aẓilut is taken to be simply the direct emanation of God, in contradistinction to the other emanations derived from the Sefirot. Moses Cordovero and Isaac Luria (sixteenth century) were the first to introduce the fourfold world as an essential principle into cabalistic speculation. According to this doctrine the Aẓilah-world represents the ten Sefirot; the Beriah-world (world of creation) the throne of God, emanating from the light of the Sefirot; the Yezirah-world (world of becoming) the ten classes of angels, forming the halls for the Sefirot; and the Asiyah-world (world of making, that is, of form) the different heavens and the material world. In contradistinction to the Aẓilah-world, which constitutes the domain of the Sefirot, the three other worlds are called by the general name "Pirud" ( ). Later cabalists explain "Aẓilut" (according to Ex. xxiv. 11, and Isa. xli. 9) as meaning "excellence," so that according to them the Aẓilah-world would mean the most excellent or highest world.